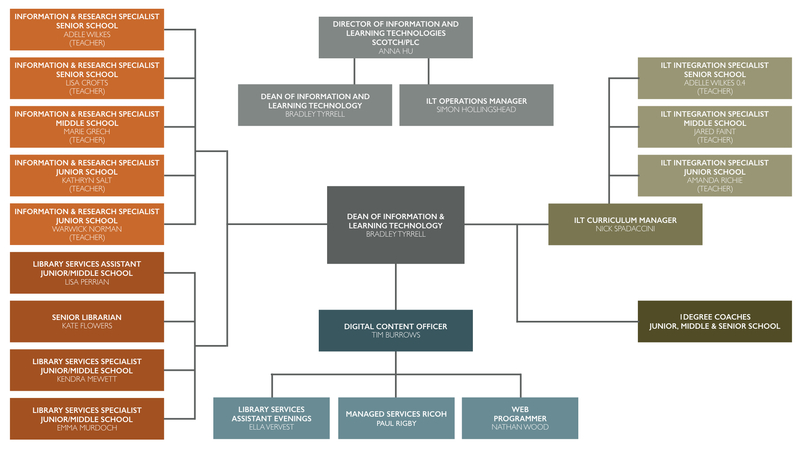 The Dean of Information and Learning Technology is responsible for the strategic operation of all positions as shown in the organizational chart below. This chart has certain unique characteristics that help to provide a more holistic view of support to the Scotch community. The Dean ILT reports directly to the Director of Information and Learning Technology and works alongside the Information Learning Technology Technical Manager to support the overarching goals of the strategic plan. This structure is somewhat unique - as library has traditionally reported to the Teaching and Learning/Deputy Curriculum in many other Colleges - and is due to the increasing complexity of library services and overarching integration with ILT creating a natural tendency for the departments to align. Furthermore, it follows that the Dean of ILT taking responsibility for the ILT integration team enhances the implementation of a consistent strategic vision. It is important to note, however, that curriculum is still a major part of the library operations, with the Dean of ILT sub-reporting to the Director of Teaching and Learning. This relationship is critical as the library co-ordinates key relationships with individual departments to build resources and services in support of the boys learning goals. The library team, regardless of physical location, all report to the Dean of ILT in a flat structure to ensure that each individual has direct access to the strategic operations of the library spaces. While day-to-day tasks are given to the Information Service Specialists (traditionally library technicians) via the Information Research Specialists (traditionally teacher librarians), each member of the library team has one-on-one meetings with the Dean of ILT fortnightly. At Scotch the ILT Integration Specialists look after the integration of technology into the teaching and learning programs. Each ILT Integration Specialist is responsible for a sub-school and reports through to the ILT Curriculum Manager, who oversees the 1-12 implementation of technology. The Reprographics department handles all printing, postage and deliveries across the College. This area also reports to the Dean of ILT with the intention of optimising printing habits and the updating and conversion of resources into the LMS. 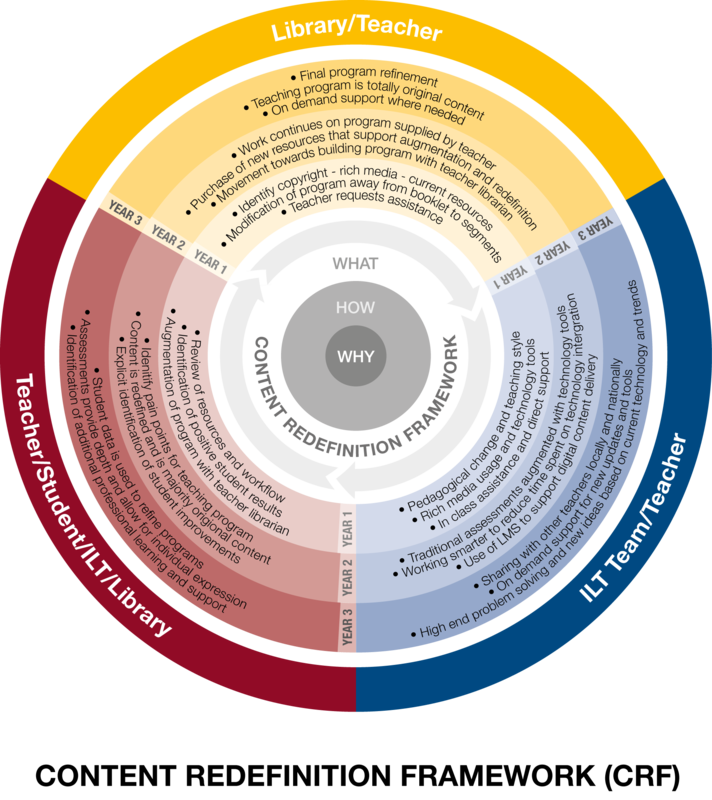 From these areas, the graphic below is a representation of how the Library and the ILT teams work together in this structure to support teachers as they adapt to new digital resources and pedagogical methods of teaching. Staff member requests resources and help from the library for a teacher program. Library meets with staff member and establishes specifics of the request. Library starts mapping resources and communicates with the ILT department when needed. Library helps create resources, passes this on to the teacher and the ILT team to directly support the teacher in the room with any technology integration for pedagogy (the library usually helps here as well), meaning the teacher now has the library, ILT Coach and ILT technical team all actively supporting their request. The program runs the program, then feedback is sought. Library meets with ILT Coaches, ILT Technical, teacher and students to discuss the success/failure of the resource. Library works on resource with ILT looking at pedagogy and technology integration issues. This process is generally done for most areas of contact for ILT or Library staff and is discussed at various meetings (normally once a week).